It started long before Narendra Modi took office. 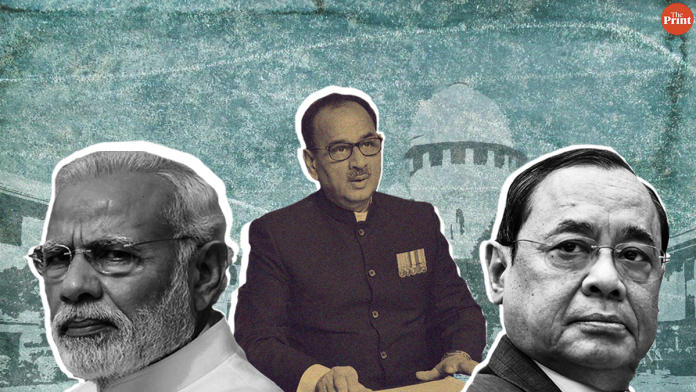 To untangle the sordid controversy over the removal, restitution and re-removal of Alok Verma as the Central Bureau of Investigation (CBI) director, it is useful to look at the affair from the perspective of ‘dharma’. Now the word ‘dharma’ is derived from the root ‘dhr’, which means ‘to hold together, to preserve, maintain or keep’. Dharma, therefore, is a set of norms, rules, behaviours, thoughts and actions that keep something together. It is contextual, depending on what the ‘something’ is. Of course, the word ‘dharma’ is also used to refer to righteousness, duty, morality, law and religious denomination. But at the heart of it, dharma is still about holding things together: from day-to-day interpersonal affairs, to human relationships to political institutions. It follows that ‘adharma’— that is non-dharma or anti-dharma — would cause things to break up or collapse. The CBI controversy is an example. Indeed, it is impossible to diagnose the steady collapse of governance and public administration in India without reference to ‘dharma’. The simple question is: Are the individuals concerned acting in ways that hold the institution together? Are they acting in ways that preserve the trust that people have placed in them? Are they acting in ways that the social contract between the government and the governed is maintained? The answer is a clear “no”. The facts related to his sacking and thereafter are well known, so I won’t repeat them here. But let’s assume Mr Verma is corrupt as has been alleged. Unless his corrupt behaviour started at the fag end of his career, those who appointed him were either incompetent (they didn’t perform adequate checks), complicit (they appointed him because they knew he was a bad egg) or indifferent (they didn’t care). Failing to ensure that an upright person is the head of the body charged with punishing the non-upright is ‘adharma’. If, on the other hand, Mr Verma is not guilty of the charges, then removing him without cause is also ‘adharma’. Yes, the ‘adharma’ at the CBI started long before Narendra Modi took office. But the CBI as an institution is broken today. It is hard to see how any of its prosecutions can be seen as anything but politically-motivated operations to fix those on the wrong side of power. You may score partisan debating points by saying that the caged parrot lacked credibility even before 2014, but in doing so you are merely accepting that it’s okay to allow ruling parties to use state power to fix opponents. Remember, though, that the shoe can be on the other foot. After the CBI moved against him in a mining case a few days ago, SP leader Akhilesh Yadav warned that “the BJP should remember that the culture it is leaving behind, it may have to face it in the future”. It would be as ‘adharmic’ and as wrong for a future government to use the CBI to persecute its opponents as it is for the current one. One popular belief is that we can ensure a public institution behaves properly by putting another one on top of it. When the CBI was found to be inadequate for combating corruption, the Central Vigilance Commission (CVC) was given powers over it. When that didn’t work too well, a supreme Lokpal came to be seen as the solution. We nurse hopes that while the CBI chief can be deemed corrupt and the CVC controversial, the Lokpal will somehow be a paragon of integrity. In recent months, the Supreme Court directed a retired judge to supervise the CVC’s investigation of a CBI chief accused by his subordinate; this (judge’s) report was ignored by another Supreme Court judge, who went with the Prime Minister’s view that the CBI chief was guilty. Would things have been better had there been a Supreme Court-appointed observer in a Lokpal, who would submit another report that might or might not be read by the CVC, the Appointment Committee of the Cabinet and the Supreme Court? Obviously not. Too many supervisors, too much complexity. The head explodes. In fact, the solution is simple. And it is ‘dharma’: the simple idea that everyone should perform their assigned roles and functions. That means being unafraid of political pressure, being unmoved by gratification, unconcerned with which way the electoral winds are blowing. So, the solution is profoundly difficult. But we have no choice. We are not a Semitic civilisation. We are a secular republic. Therefore, to call the Constitution a holy book is doubly wrong. Moreover, it is possible to worship a book while violating the essence of what’s written in it. We are a ‘dharmic’ civilisation, held together by norms, codes and actions. You can call me naive. You can call me an idealist. But the only way to restore confidence in the institutions of the Indian republic is when we both act and expect people to act in accordance with their ‘dharma’. We should see the Constitution as laying out our ‘dharma’, not as a holy book. And the process of practising and upholding dharma must start from the top. Tad tad evataro janah. The rest will follow. Otherwise, things will continue to fall apart. As directed by SC, the Commitee of three decided to remove Mr. Varma as Director of CBI. As the due process was followed, I do not see any issue in the decision taken by the Committee, whether the decision was as expected or not. Even if he was clean as Ganga, the committee could remove him based on material placed before it. He is not under some departmental enquiry wherein he has to be given opportunity to defend himself. He was removed from the post of Director and was offered another post, pending enquiry. So where is the issue? Unless your purpose is to hit Modi. When he sent on leave, the same logic followed. It was done without consulting the Committee and now it is done by the Committee. The judge of SC is presumed to have acted independently and with full sense of responsibility, even if his vote was not as expected by you! The points Meade by Pai make eminent sense but in the current context, we need to focus on basics. Dharma and Adharma are too philosophical for this event. It is a shame that all the top men in CBI are alleged to be corrupt and the entire organization has lost its face. The government should disband CBI forthwith and come out with a new legislation establishing a new instituio for criminal investigation under Central Government. In a country, where in Mahabharata, the Kaurawas were depicted as Adharmis, but killing of Bhishm Pitamah using Shikhandi as Shield by Arjun that too on the advice of Krishanji, is Dharma, there is no clear distinction between the two. Moreover, here in India, when we bribe the Priests of any famous Shrines to give us preference over others for Darshan and Pujas, it is Dharma for us, but when it is done by others, we call it Adharma. Here those who give offerings from their ill-gotten wealth to religious places are called Dharmis, while who can not afford to give anything there due to poverty are called Adharmis. So CBI is no exception. It sees people accordingly. In CBI episode, one cannot hold everyone not adhering to his dharma, but only the CBI chief. He was heard by SC and CVC under the supervision of a retired SC Judge. I don’t think any better and ctpredible arrangement could have been devised. The report came back to SC, which must have included the report of the supervising judge and SC after going through all these restored Mr. Verma to his position but with caveat, subject to the final decision by the selection committee. Is it that SC didn’t go through the report of justice Patnaik or didn’t find anything to suggest that CVC report was unfair and partisan against Mr. Verma. After all these measures if the competent committee found Mr. Verma not suitable for continuance further, can we blame the Committee or its members who favoured the ouster of Mr. Verma. You know and every one else know that the narrative is someone other than Mr. Vermaand let’s be honest about it. It is Mr. Modi who is the target of not only opposition, particularly Congress but also a sizeable section of media who made a profession of opposing him, not govt. I don’t know whether you call it dharma of press. Every narrative is reduced whether it is pro Modi or hate Modi; everything else is incidental. We would be serving the cause of dharma if we recognise and acknowledge this fact; rest will fall into place. Nitin Pai – do I see you as the Messiah? In a corrupt society nobody wants to trust the other,be it the CBI, CVC or now even the SC. Dharma turns into Adharma because of shortage in every walk of life. We were used to paying bribes official or otherwise for telephone connection, for gas connection, now we don’t. CBI,Supreme court,RBI,Parliament,Indian Politics ,Banks, Loans, Farmer’s loan waiver Election Commission – take anything about India-It stinks.nobody is serious about the country. We have seen this from 1947.We shall see this for another one thousand years. The RDX used in the Bombay blasts was waved through by Customs officials who were told the sacks contained contraband silver. At some stage, the corrosion becomes so toxic, the system becomes dysfunctional. See what is happening with the state government in Bangalore, both sides busy with their poaching nets. India was never Utopia. However, the pendulum has swung too far out. Voters make moral judgments as well.